BIG SHOW Dueling Pianos is also a wonderful solution for your wedding reception entertainment. If you are looking for the most interactive and fun wedding band on the planet, look no further than BIG SHOW Dueling Pianos. We are an all request show that gets all of your guests up on their feet, laughing, singing, dancing and having the time of their lives. Don’t be like every other wedding that you’ve been to and hire a lame boring DJ or a band that is too loud and that only plays a few good songs…why not hire an act that plays ALL REQUEST, gets the audience involved in the show, gets your guests up on their feet and dancing, gets the girls up to sing, gets the guys up to sing AND also DJ’s some of your favorite songs right in the middle. Dueling pianos are more popular than ever. BIG SHOW Dueling Pianos takes this to an entirely new level with their unmatched stage show, larger than life sound and lighting and their National Award Winning Vocals. 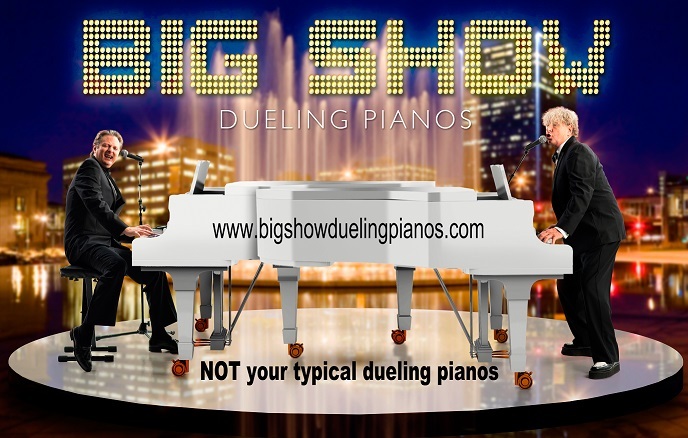 With BIG SHOW Dueling Pianos you always get the SAME TWO GUYS, not like the other companies that will “throw” you their B, C and D lineup when they run short of performers to cover their gigs. NOT WITH US! With BIG SHOW it has always been, and will always be the same two performers every show, every time, to guarantee you the quality that you deserve. Every show is all request, and we always get the audience to their feet and involved in the show. Nothing is better for a corporate event than an act like BIG SHOW that can get everyone involved in the fun – your employees will talk about the show for weeks, months and years after the event is over. We are almost ALWAYS called back for more after we perform for corporate events, we have some clients that have had us for their largest events for more than 10 years in a row! Now that’s customer satisfaction.